John Delly's 'Photography Through The Microscope', Kodak Publication P-2, Ninth Edition 1988, describes the many ways of attaching a camera to the microscope for photomicrography. I consider this book to be the standard reference for anyone interested in the operating principles of the light microscope and photomicrography. Projection into a camera back mounted on a rigid macro stand like the Leitz Aristophot or Nikon Multiphot was the method used by John for photomicrography when he was on the staff of McCrone Associates. 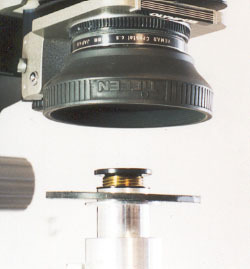 This method minimizes the effect of camera vibration because there is no mechanical connection but only a light trap between the microscope and the bellows of the macro stand. 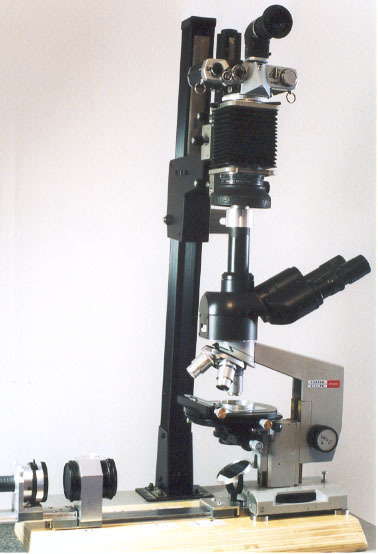 A massive and rigid stand absorbs the forces from a 35 mm camera focal plane shutter without shaking the microscope. To further minimize vibration, a leaf shutter can be used at the mouth of the bellows of the macro stand with the 35 mm camera set on bulb. I have previously used a very rigid stand I built from a modified tool makers lathe for photomacrography and more recently also for photomicrography, as shown in the supplementary page for my darkfield article in the April 2001 issue of Micscape. I have not found a need for a leaf shutter with this massive and rigid stand. I recently disposed of my darkroom equipment but kept the enlarger stand. I chose to keep the stand because it can serve as a copy stand and also to hold a camera back for photomicrography. Since I now have two student microscopes for family use, having a second stand makes sense for this reason and also because it is far more portable than the heavy photomacrography stand. Figure 1 shows the enlarger stand with the vertical tube of trinocular head on a Biolam (Multiscope) projecting into an OM-4 camera back mounted on an Olympus bellows. I use the OM photomicrography 1 - 12 focusing screen in the camera and view the screen through an Olympus Varimagni Finder. An Olympus plastic cover with bayonet lugs fitting the lens mount in the bellows was bored out and a flexible lens hood was epoxy bonded to make the bellows side of a light trap. A black plastic disc on the trinocular vertical tube nests inside the lowered hood without touching the inside of the hood. These details and the projection eyepiece are shown in Figure 2. The projection eyepiece is a LOMO 7X measuring eyepiece with the reticle normally removed and the eye lens adjusted outward to form a real image at the camera film plane. The reticle can be reinserted when a scale and cross lines are needed in the photomicrograph. I first had to add an extension to the photo tube adapter of the trinocular head so that the eyepiece reticle would be simultaneously in focus with the image viewed through a focused reticle eyepiece in the binocular viewing system. The black plastic disc of the light trap sits on a narrow flange of the extension made for the vertical tube. (The disc is not fully seated in Figure 2). Since many of the readers may own LOMO Biolam microscopes, some details about the LOMO optics could be helpful. I have found that the short mount 160 mm tube length LOMO objectives require the same compensating eyepiece system as previously used by Carl Zeiss. I normally use a Zeiss 12.5X kpl eyepiece for viewing with a drawtube in a monocular system. The projection eyepiece I use for photomicrography with the monocular system is a Zeiss 8X kpl measuring eyepiece with the reticle removed and with modifications to increase the separation of the eye lens from the field lens. The Zeiss kpl eyepieces correct for both difference of chromatic magnification and flatness of field. The magnification changer lenses in the LOMO trinocular head correct for flatness of field, so the image is then sharp from center to edge when using the LOMO eyepieces but not the Zeiss kpl eyepieces. The LOMO eyepieces correct only for difference of chromatic magnification. Figure 1. Biolam microscope with enlarger stand to support the camera. The lighting is an unconventional Köhler illumination system using a fiber optic light guide as the source. The aperture diaphragm is located at the light guide end. The collector lens with field diaphragm is made from a 50 mm f/1.8 camera lens. The first surface mirror is slider mounted. A LOMO 1.40 aplanatic substage condenser is used. The illumination components are slide mounted so the illumination beam is fully focusable and alignable for tilt and translation to center the focused image of the field diaphragm in the field of view and the focused image of the aperture diaphragm in the rear of the objective. Figure 2. Detail of the projection eyepiece and light trap. Published in the August 2001 edition of Micscape Magazine.